On Thursday, we began our new topic for the next two weeks, which is the subject of literary evolutionism. Seeing as how this segment of the course investigates the reach of Darwin’s ideas into the Humanities, it’s only fitting that we explore this growing group of academics who are interested in how literature reflects Darwin’s theories of natural selection and its related field of gene-culture coevolution. 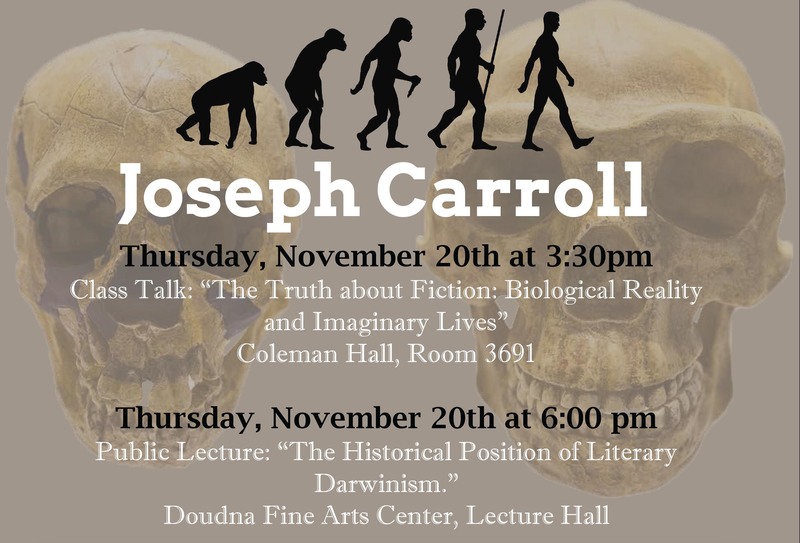 In fact, our class is fortunate to have Joseph Carroll, one of the founding fathers of this school of criticism, visit in two weeks! There are a lot of different types of literary evolutionists, or literary Darwinists, but one question that some literary evolutionists are investigating is why do we read? Why do we love story? I began by asking the class how much of their daily lives are spent in the realm of story—if one opens that up to daydreaming; watching movies, TV, or music videos; listening to songs; and those old-fashioned things called books. Within my class of twelve students, many said that they guessed 50-80% of their lives revolved around story. I don’t know if my students are all that different from the public. Jonathan Gottschall, author of The Storytelling Animal, has estimated that we spend about five hours per day “awash in the glow of television and movie screens.” But if you broaden the definition of story to include songs, daydreaming, and reading, it would be even more. So, if we are spending so much of our time surrounded in story, what do we get out of it? One psychology study recently reported in the New York Times said that those who read literary fiction (as opposed to mass-market fiction) have better social skills. “…People performed better on tests measuring empathy, social perception, and emotional intelligence—skills that come in especially handy when you are trying to read someone’s body language…”. Study participants read some Chekhov, so I asked the class to read “Lady with Lapdog.” We spent an hour moving through this story and looking into this sad affair between two married people in the late 1800s. Neither person was happily married, but neither had a way to get out of it. It was 1898, after all. Our class quickly recognized the bind the characters were in. The discussion did not revolve around condemnation as the story presented too much complication for that. Instead, we focused on small details, trying to articulate when Dmitri Gurov moved from passion to true affection in the story, trying to articulate when Anna Sergeyevna realized she was worse off than before. In other words, we practiced reading people.